These people live in a wonderful world: all magnificent deserts, rustic paths and well-shod feet (photographing your own feet is a particularly cool idea, suggests Apple). It doesn’t take a misanthrope to find this array of perfect modern beauty a bit false. No wonder a couple of Californian pranksters have been putting up satirical Apple posters that show, instead of ravishing sunsets, the kind of things they reckon people really take photographs of with their phones – clumsy selfies, mostly. But hang on. Yes, the anti-Apple posters are funny – an obvious, crude, levelling joke that brings the ethereal iPhone advertising campaign crashing down to earth. And yet, they make me look again at the iPhone 6 ads. Is it really so awful to want to capture images of beauty? And is it really true that in reality we’d all rather take horrible narcissistic selfies? I know that if I was in the places that Gabby K and co have been, I too would try to capture the wonder of it all on camera – in my case an iPad Air – and would dismally fail. It is not easy to take pictures as nice as these. Apple is right to preach beauty. All of us are in the gutter – at least Apple is looking at the stars. 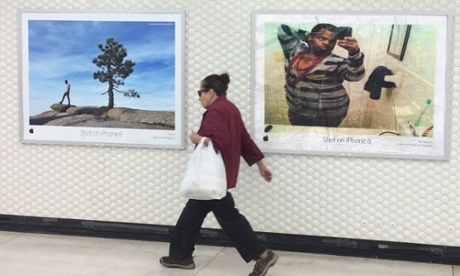 The fault of the iPhone 6 art gallery is not its love of beauty. It is the inability of modern photography to see complexity. 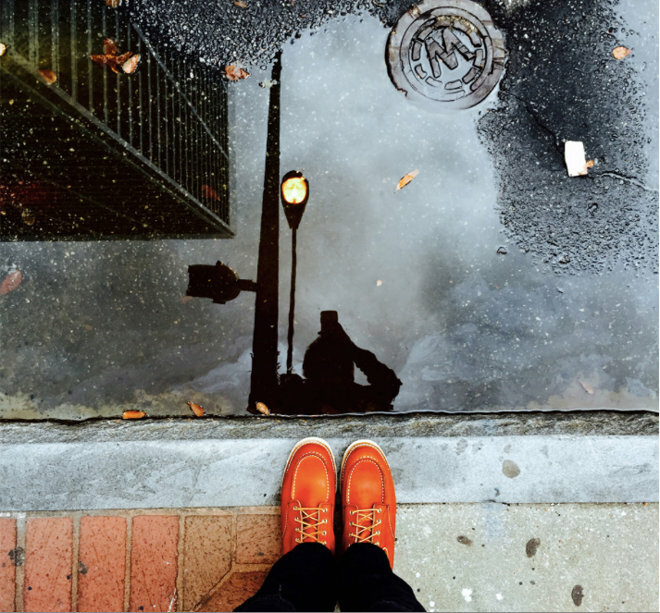 The more our cameras make moments look lovely, the less we seem to photograph – or see? – the depth of reality. It is harder than ever for us to recognise the limitations of photography. To put it bluntly: a camera only has one eye. It only records a frozen view as seen by that eye. We are accustomed to accept this as a truthful record of things as they are, but it is just a thin, superficial sliver of the world we actually experience. Look around you for a few seconds. Really look. Just moving your eyes around reveals an almost infinitely rich cavalcade of things, near and far, in shadow and light, moving, changing size, changing significance as we focus and refocus – you notice one thing then another. Not a single photograph ever taken has captured the richness of a city street seen by human eyes. Photos, even the best of them, are flat and arid in comparison with human perception. A cubist still life is much closer to reality than photography can ever be – a fact that David Hockney tried to get beyond by making “cubist” photocollages. Sebastiao Salgado, the greatest living photographer, undoubtedly captures a vast, detailed visual field in his vistas of primeval mines and tumultuous crowds. But it is a long way from the endlessly changing, multitudinous complexity we actually experience, and that Cézanne or Picasso painted. We are fooled into thinking the camera is an extension of our selves – even an improvement. Get in the mood and you can take hundreds of images in a short space of time, photographing the moment as easily as living in it. But here is the real problem: it blinds us to the wonders of our own perceptions. Our eyes are the best cameras ever made – and then some – and we need to rediscover our potential to look, remember and marvel. I am far from immune to the lure of instant photography. On a recent trip, I clicked away constantly, somehow convincing myself I could contain the light of north Africa. The resulting pictures were nothing like what I had seen. I regretted spending so much time limiting my perspective through a viewfinder. I really think the more time we spend actually looking, and remembering, the richer our lives are. Instead of taking a photograph why not try doing a drawing? It makes you see more. A camera makes you see less. In the end, it is only our real experiences that constitute our lives. “Was your life a good movie?” as Jim Morrison asked. Not if you spent it taking snaps. Your feet in a puddle? There’s so much more going on.